Here are practical information about Boston and smart travel recommendations, with a chance to find more about the city's attractions, excursions, and events. The old but open to the new, the big but not complicated, the crowded but relaxing… The beautiful Boston can be described with thousands of words but these are to stay no matter how much time passes. Regarded as the ‘the most clever city in the US’ because of being the home to the most prestigious universities in the world, Boston ranks the 10th most visited city in USA by travelers. 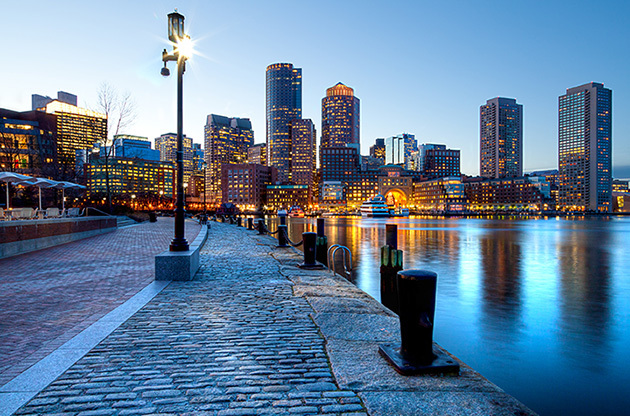 The capital of the state of Massachusetts, Boston is one of the cities in the country that has a European look that is combined with pure American aesthetics. The population of the city is almost 625.000 and there are 15 different districts in the city. Boston is one of the most famous cities in the world for many reasons. Firstly, as mentioned before, regarded as the best universities ever, Harvard, MIT and Berklee College of Music and a bunch of others are located in Boston or Cambridge and Brookline which are integrated with the city. Secondly, Boston is the city where some of the most famous series such as Ally McBeal, Cheers, Dawson's Creek and a more recent one, Fringe are shot in. The last but not the least, Boston’s NBA team, Boston Celtics and baseball team, Red Socks are two of the most successful and assertive ones in the US. You will find a lot of things to fall in love with Boston but the first thing will probably be the architecture and its beautiful streets. The picturesque look of the city is created by the historical buildings, parks, squares and beautifully designed houses. A trip to this city will tell you a completely different story of the classic American image. The city will come up with something new every time you think you have seen enough of it. At the end of your stay, you will find yourself looking for ways to come back again. Boston is located on the east coast of the state of Massachusetts, and Massachusetts is located on northeastern part of United States. How to get to Boston? Boston Logan International Airport is located approximately 5 km from the center of Boston. The official official website of Boston Logan International Airport gives detailed information about the airport transportation. Probably, another thing you will love about this city is its the clean, fast and accessible public transport. You can find all the information you need on mbta.com , the official website of the Massachusetts Bay Transportation Authority. Keep in mind, it is not recommended to rent a car in Boston due to the parking lot problem and the traffic jams that occur most of the time. Boston offers the visitors a great number of attractions. These can be visits to museums, major points of interest or sports and recreation activities. In addition, the variety and quality of the restaurants, the shopping areas that have it all and the shiny night life will make you stay longer in Boston. There are so many museums in the city that if you want visit all of them, then you may need an extra week. From historical to the modern, varying in fields, the museums in the city are some of the richest in terms of their content. Fenway Park, John F. Kennedy Library, Faneuil Hall, Freedom Trail, Boston Common and Bunker Hill Monument are some of the major sights to see in the city. In addition, wandering through the campuses of the famous universities in the city is also common among the visitors. Newbury Street, Downtown Crossing, Harvard Square, Coolidge Corner and Charles St. are predominant shopping areas in the city. You can find both the worldwide known American brands’ stores and smaller shops that sell more local stuff. If you want to dig in the malls in the city, then The Cambridgeside Galleria, Copley Place and Prudential Center are among the best ones in the city. If Boston were a beach, then we could call the restaurants in the city was sand. For every type of diet and eating habits, you can find exquisite places to choose from. Boston’s cod, clam chowder and baked beans are famous. You can find restaurants serving these with a bunch of other delicious options around North End. If you prefer more ethnic food, then Coolidge Corner, Chinatown and Allston areas are at your service. One specific recommendation, if you are fan of the series Cheers, you can still visit the pub, Bull & Finch, in Beacon Hill. Thanks to the large Irish population in the city, Boston has got some really good Irish Pubs. Canal Street, Landsdowne Street and Fenway area, Faneuil Hall, Harvard and Brighton Avenues and Boylston Street are some of the places in Boston that has got some of the nicest bars and clubs in town. Cycling, watching a play, listening to a concert by Boston Symphony Orchestra are among the popular things to do in the city. If you are lucky, you can have an unforgettable time by going to a game of Boston Celtics or the Red Socks. If you feel like going outside of Boston and see more of the area and the state, then Salem, Concord, Lexington or Lowell (hometown of the great Jack Kerouac) might be interesting destinations to explore. Every year, Boston welcomes thousands of visitors. A vast majority of these come to this great city in order to attend the congresses, conferences, symposiums, exhibitions, fairs or tradeshows that take place in Boston. Venues that have the latest technology, hotels around them and the expertise of the organizers turn Boston into a center of large scale international events every year.